Martin Wheeler was described by Black Belt Magazine as "...one of the best kept secrets in English speaking martial arts instruction". Born in England, Martin walked into his first training hall at the age of nine, a Judo class at the local YMCA in his home town of Paignton. At age sixteen he began training in the Hawaiian street fighting system of Ed Parker’s Karate, at the ‘doorman’s academy’ in the same town. Named because many of the local bouncers trained there he was introduced to Kenpo in bare knuckle sparring sessions. A year later he began working at the local clubs as a bouncer, a profession he continued for the next ten years in clubs from London to the U.S. Twenty years later, after studying Boxing, Judo, Thai-boxing and Filipino weapons fighting Martin met Vladimir Vasiliev, the former Russian Special Operative demonstrating Systema at a seminar and knew he had witnessed something strange, unique and absolutely lethal in any environment. Martin now teaches his highly effective combat solutions around the globe. 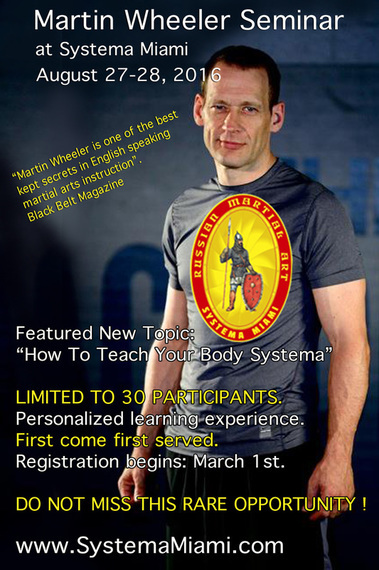 “Martin Wheeler is one of the few instructors who understood Systema very quickly and has a very high level of skill and knowledge. I highly recommend training with him to anyone with a serious interest in martial arts.” - Vladimir Vasiliev. To make this incredible experience as personalized as possible we will limit this event to 30 participants. The first 30 people to register will be the lucky participants for this very special event. Time: 11am to 4pm. Registration: 10:15am. Online registration required. Rates will vary on a first come first served basis. This event will sell out shortly, register ASAP. Airport: Both Miami International (MIA) and Fort Lauderdale International (FLL) are about 25 minutes from this location. In general terms, there are plenty hotels in the area. Click on Google Map for nearby hotels. Or just google hotels in Aventura or North Miami. Training knife (available for purchase here). Check the event's facebook page for details.